The Junior Men saw the first ever Dum-Dum 540 landed in competition, behind the Centurion Ri23 (https://centurionboats.com/boats/ri237/), by Ulf Ditsch (ARG) who won the Silver medal. Great Britain’s Luca Kidd won the Gold medal and Same Brown from Australia won the Bronze. 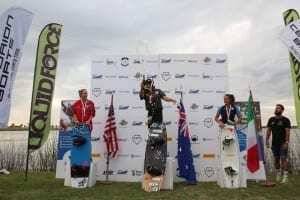 In the Open Women’s final, Rebecca Gange (AUS) made an emotional come back to international competition after a lengthy absence due to injury to win the Gold medal, edging out Silver medalist Dallas Friday (USA) and Bronze medalist Chiara Virag (ITA). 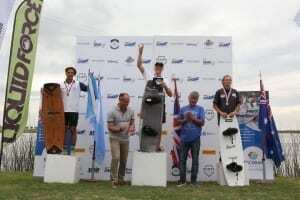 The heavy hitters in Open Men brought the IWWF Word Wakeboard Championships to a close with Cory Teunissen (AUS) landing a 1080 and grabbed doublé half cab roll to win his first Gold medal at an IWWF World Championships. Defending Open Men’s Champion Massimiliano Piffaretti (ITA) had to settle for a Silver medal followed by Nic Rapa (AUS) winning the Bronze. Team Australia, with 4 individual gold medals, won the team overall Gold medal by only 5 points, edging out defending champions Team Italy with 2 individual gold medals. 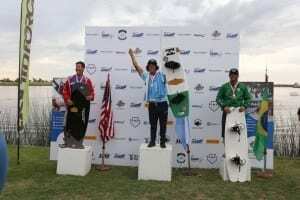 The host country Argentina, with one individual gold medal, won its very first IWWF World Championships team overall medal with a Bronze.